Fleshy perennials, shrubs, trees or vines, terrestrial or epiphytic. Stems jointed, terete, globose, flattened, or fluted, mostly leafless and variously spiny. Leaves alternate, flat or subulate to terete, vestigial, or entirely absent; spines, glochids (easily detached, small, bristlelike spines), and flowers always arising from cushionlike, axillary areoles (modified short shoots). Flowers solitary, sessile, rarely clustered and stalked (in Pereskia), bisexual, rarely unisexual, actinomorphic or occasionally zygomorphic. Receptacle tube (hypanthium or perianth tube) absent or short to elongate, naked or invested with leaflike bracts, scales, areoles, and hairs, bristles, or spines; perianth segments usually numerous, in a sepaloid to petaloid series. Stamens numerous, variously inserted in throat and tube; anthers 2-loculed, dehiscing longitudinally. Ovary (pericarpel) inferior, rarely superior, 1-loculed, with 3 to many parietal (rarely basal) placentas; ovules usually numerous; style 1; stigmas 2 to numerous, papillate, rarely 2-fid. Fruit juicy or dry, naked, scaly, hairy, bristly, or spiny, indehiscent or dehiscent, when juicy then pulp derived from often deliquescent funicles (except in Pereskia). Seeds usually numerous, often arillate or strophiolate; embryo curved or rarely straight; endosperm present or absent; cotyledons reduced or vestigial, rarely leaflike. Li Zhenyu. 1999. Cactaceae. In: Ku Tsuechih, ed., Fl. Reipubl. Popularis Sin. 52(1): 272-285. 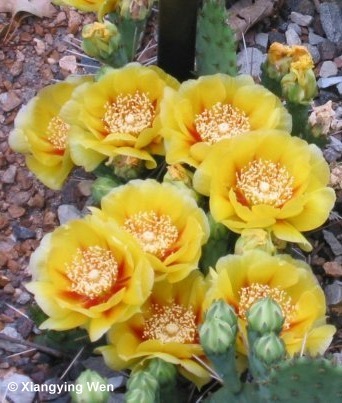 Cacti are poorly collected and recorded, particularly anywhere they are naturalized. About 110 genera and more than 1000 species: temperate and tropical America; Rhipsalis baccifera (J. S. Mueller) Stearn native in tropical Africa, Madagascar, Comoros, Mascarenes, and Sri Lanka; some species of other genera now extensively naturalized in the Old World through human agency; more than 60 genera and 600 species cultivated as ornamentals or hedges in China, of which four genera and seven species more or less naturalized.